I’ve never been one to know what it’s like to have perfectly clear skin. 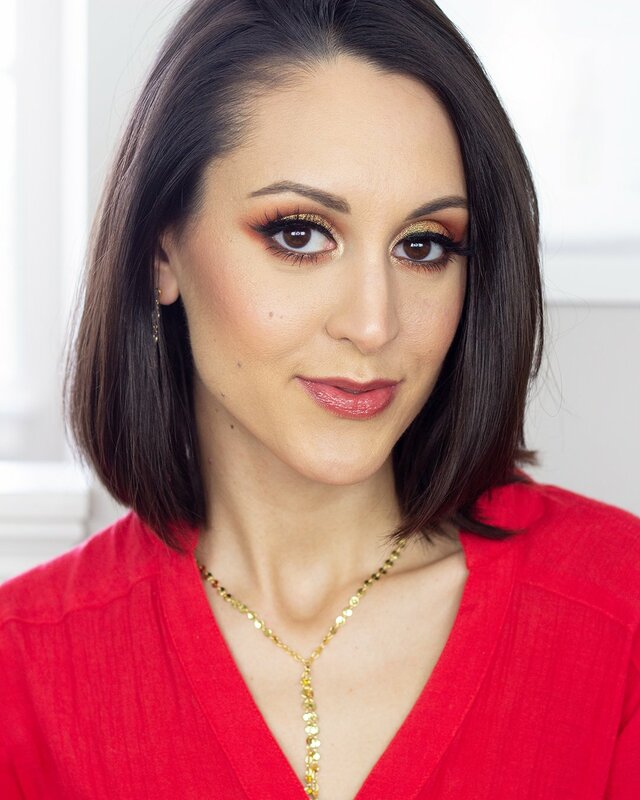 Over the years I’ve battled with acne, large pores, hyperpigmentation, and scarring. My face is incredibly oily year-round, although in the dead of winter I’ve been known to also suffer dryness around my cheeks. Basically, since the ripe old age of 11 I’ve been fighting the good fight, trying to banish breakouts and helps keep my oiliness under control. My younger self was much more apt to fall for marketing ploys (“yes, you need oil-controlling everything! !”), and as a result my teenage years were pretty miserable skin-wise. I used cleansers and acne treatments that were way too harsh, skipped moisturizer, and hardly ever wore sunscreen. Eventually, though, I woke up to the damage I was doing, and decided to put serious effort into understanding my skin and what it needed. Flash forward 10 years and my face is better than its ever been. Sure, its not as baby-smooth and flawless as my pre-pubescent self, but its finally free of constant, active breakouts. All-in-all taking a more gentle and mindful approach to my skincare has worked wonders. 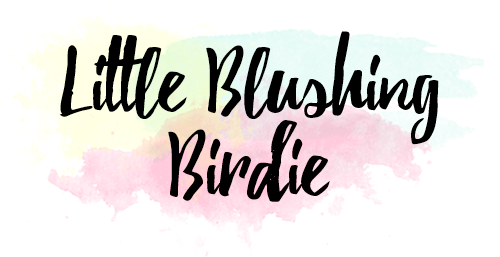 Which brings me to the latest addition to the Little Blushing Birdie lineup. 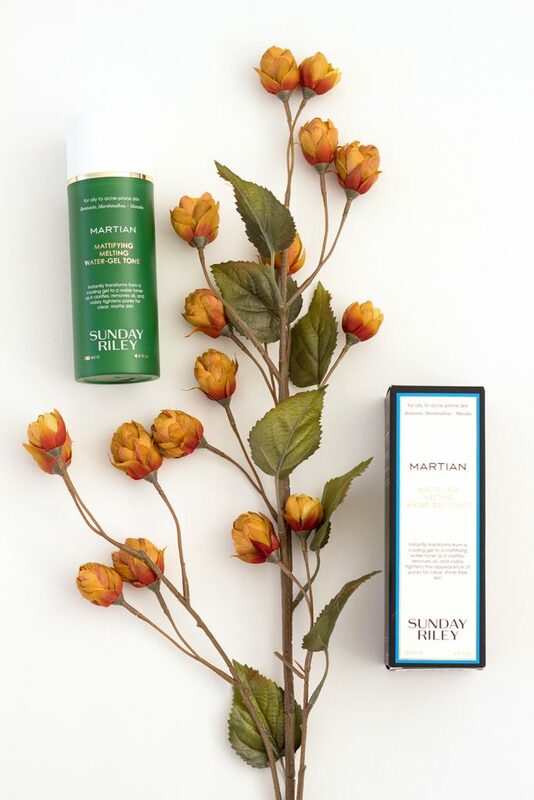 Sunday Riley is one of those luxury skincare brands that’s piqued my interest for months. 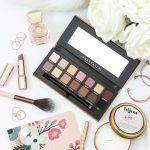 Other bloggers constantly rave about how amazing their products are, but the hefty price tags often hold me back. 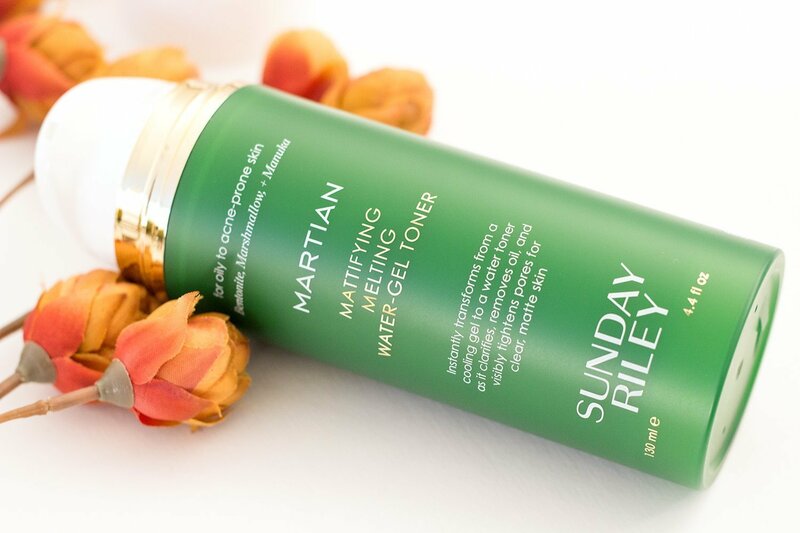 So when Sephora was offering a promo code to redeem for a deluxe sample of the Sunday Riley Martian Mattifying Melting Water-Gel Toner, you can bet I was all over it. 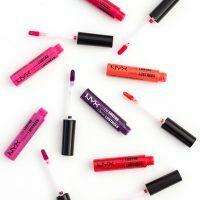 From the first use I knew this was a special product, and before my sample got low I found myself running out to Sephora to pick up the full size. At this point you may be wondering what kind of magical elixir is inside this green bottle, because you know that budget-conscious Lauren is not one to shell out $55 on a product without batting an eye. 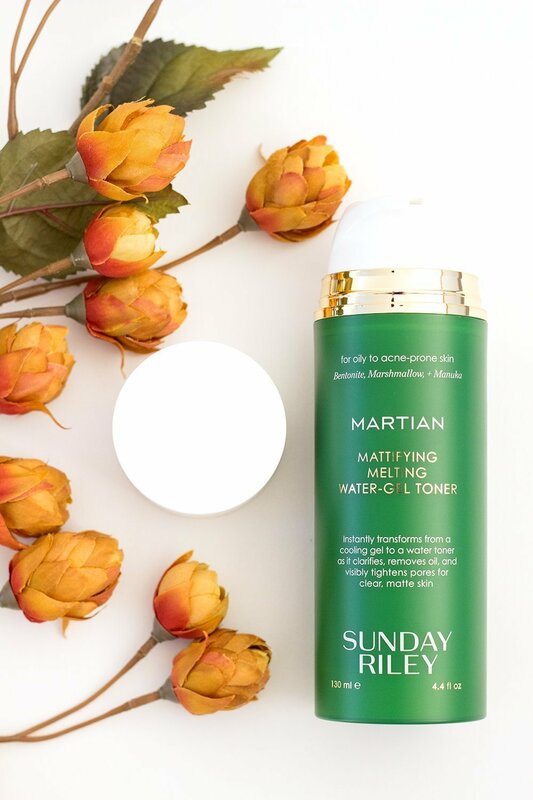 However, the Martian Mattifying Melting Water-Gel Toner is truly one of the more unique things I’ve ever put on my face. It’s a lightweight gel-lotion that transforms into a water toner as you massage it into your skin. The formula is designed to help control oil and refine the look of pores, leaving your face looking fresh and feeling matte and silky smooth. I love how quickly it absorbs into my skin, and that it doesn’t leave behind any kind of sticky residue. 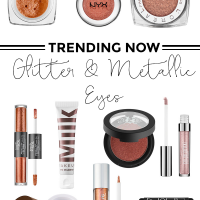 You can use it morning and night, but I especially love how it helps my makeup apply more easily in the daytime. All you need to do is massage it into your skin with your finger tips after cleansing. Or, if you prefer, you can swipe it on with a cotton pad like a traditional liquid toner. 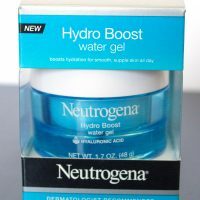 Even though the product pumps out looking like a milky gel-cream, it feels as lightweight as water on the skin. It’s super refreshing! Now, if you’re a green beauty enthusiast, I will warn that this is not an all-natural product. 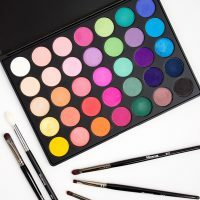 While it does contain synthetic ingredients (although it is free of parabens, phthalates, and sulfates), it also contains a bunch of powerhouse plant oils and extracts. There’s bentonite clay to mattify and visibly reduce the size of pores, Marshmallow extract to reduce redness and soothe irritation, Cucumber and Witch Hazel to tone and tighten, and Manuka Leaf Oil (a relative of Tea Tree Oil) which has natural antibacterial properties that will help fight breakouts. As far as I can see, the formula does not have any added fragrances or dyes, making it more friendly to those with sensitive skin. It does, however, have a bit of a strong scent upon first application, but this fades as the product dries down. I personally love the way Martian smells – fresh and slightly herbal – but its worth noting if you’re particularly sensitive to scents. Full Ingredients // Water, Alcohol Denat., Dicaprylyl Carbonate, Dimethyl Isosorbide, Sorbeth-30 Tetraisostearate, Sorbitan Sesquiisostearate, PPG-8 Ceteth-20, Acrylates/Beheneth-25 Methacrylate Copolymer, Dipropylene Glycol, Taraktogenos Kurzii Seed Oil, Nigella Sativa (Black Cumin) Seed Oil, Leptospermum Scoparium (Manuka) Branch/Leaf Oil, Potassium Lauroyl Wheat Amino Acids, Palm Glycerides, Capryloyl Glycine, Magnolia Grandiflora Bark Extract, Lauryl Lactate, Phenoxyethanol, Caprylyl Glycol, Chlorphenesin, Tapioca Starch, Polymethylsilsesquioxane, Bentonite, Tapioca Starch (and) Polymethylsilsequioxane, Lauryl Lactate, Phenoxyethanol, Propanediol, Cucumis Sativus (Cucumber) Fruit Extract, Althaea Officinalis (Marshmallow) Root Extract, Hammamelis Virginiana (Witch Hazel) Leaf Extract, Camellia Sinensis (Green Tea) Leaf Extract, Cymbopogan Schoenanthus (Lemongrass) Oil, Chlorphenesin, Caprylyl Glycol, Triethanolamine, Melia Azadirachta Leaf Extract, Melia Azadirachta Flower Extract, Amino Esters-1, Mimosa Tenuiflora Bark Extract, Coccinia Indica Fruit Extract, Solanum Melongena (Eggplant) Fruit Extract, Aloe Barbadensis Flower Extract, Lawsonia Inermis (Henna) Extract, Ocimum Sanctum Leaf Extract, Curcuma Longa (Turmeric) Root Extract, Corallina Officinalis Extract, Ocimum Basilicum (Basil) Flower/Leaf Extract, Pearl Powder. After using this product consistently for several weeks I definitely started to notice a difference in the texture of my skin and also how much oil it was producing. Normally I wake up in the morning feeling like a grease ball, and am desperate to immediately wash my face. However, after using this product I now wake up with my face feeling incredibly smooth and shine-free. Seriously, it kind of blew my mind. Also, even though this product is specifically formulated for oily, acne prone skin I always am leery of breakouts when I try a new product. So far, though, it appears that this product has not caused my skin to flare up, and if anything has helped it to remain more clear. 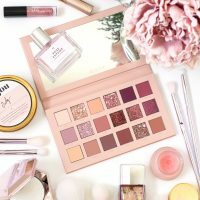 Is this product crazy expensive? Yes. Is it worth it? In my opinion, it absolutely is. I’ve had such a hard time falling in love with a serum or toner, despite having tried dozens of different ones. This, however, seems to be the perfect match for my oily, problem skin. I should also note that, even though Martian is pricey, the bottle is pretty sizeable. For $55 you’re getting 4.4 oz of product. I’ve found that one pump has more than enough product to cover my entire face and neck, so I anticipate the bottle lasting me several months, even with twice daily use. To compliment this product, Sunday Riley also released the U.F.O. Ultra-Clarifying Facial Oil, which has a 1.5% concentration salicylic acid to help refine the texture of your skin and fight against breakouts, while also providing extra hydration and creating a protective barrier for the skin. Together they’re a little mean, green, acne-fighting machine. 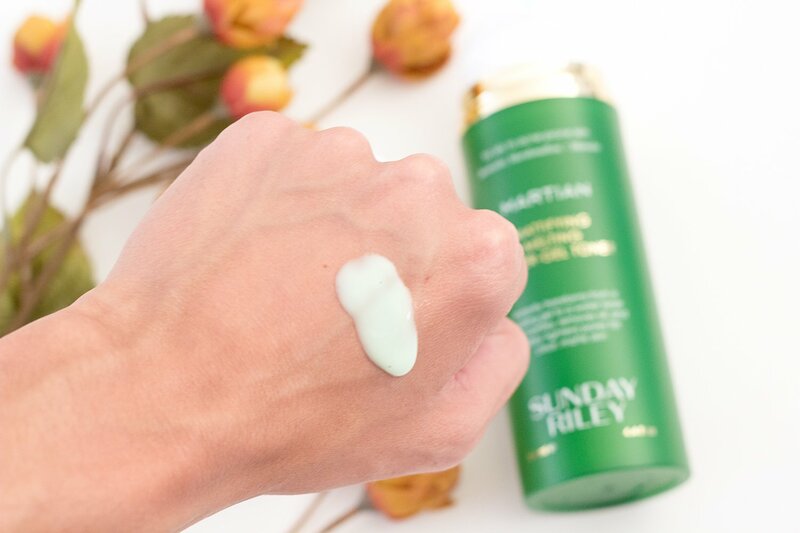 If you’ve tried any Sunday Riley products, I’d love to hear your thoughts on them! Did you think they were worth the high price tag? 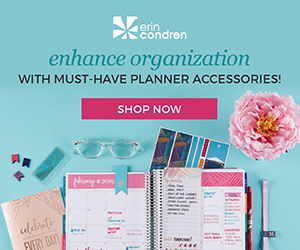 Is there anything you’ve found you can’t live without? Tell me about it in the comments below! Also, I’ve been thinking about writing a post about my current skincare routine. Let me know if this is something you’d like to see! 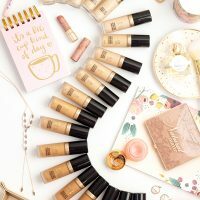 What are your biggest skin concerns?